Thompson: McCain "has never sought an earmark"
Thompson: Obama "most liberal, most inexperienced nominee to ever run for president"
ST. PAUL, Minnesota (CNN) -- Former Sen. Fred Thompson vehemently defended the selection of Sarah Palin for vice president Tuesday garnering huge applause from the crowd at the Republican National Convention. 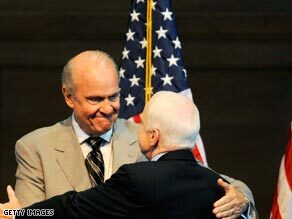 Sen. Fred Thompson campaigns with John McCain earlier this year. "What a breath of fresh air Gov. Sarah Palin is," said Thompson, who dropped out of the Republican presidential race in January. "Give me a tough Alaskan governor who has taken on the political establishment in the largest state in the union -- and won -- over the beltway business-as-usual crowd any day of the week." Thompson also praised McCain and talked about how his ordeal as POW shaped his character. Thompson gave a detailed version of McCain's years as a POW in Vietnam. "The guards cracked ribs, broke teeth off at the gums. They cinched a rope around his arms and painfully drew his shoulders back," Thompson said. "We hear a lot of talk about hope. John McCain knows about hope. That's all he had to survive on." Thompson, an actor and former star of the NBC's hit series "Law and Order," also took many shots at Democratic presidential nominee Sen. Barack Obama. Thompson said Obama is "history-marking nominee for president," Thompson said. "History-making in that he is the most liberal, most inexperienced nominee to ever run for president." Thompson dropped out of the race for the GOP nomination after a disappointing third-place finish in the South Carolina Republican primary, where he drew 16 percent of the vote. Earlier, Thompson finished third in the Iowa caucuses, fifth in the Michigan and Nevada primaries, sixth in New Hampshire's primary and a distant second to Mitt Romney in the Wyoming caucuses. Thompson also took shots at some of the speeches made at the Democratic National Convention last week. "Listening to them you'd think that we were in the middle of a Great Depression; that we are down, disrespected and incapable of prevailing against challenges facing us," Thompson said. "But we also know that we live in the freest, strongest, most generous and prosperous nation in the history of the world and we are thankful."